James Cameron is that rare breed of filmmaker that has the world at his fingertips with all the money to make a movie he could ever need and a track record that speaks for itself, but he always operates with the heart of a small indie filmmaker. He is a visionary and an innovator and has done much more for the technology of films than most filmmakers. When he was making Titanic, all of the buzz in the movie community and among movie goers was that it was going to be one of the most expensive flops of all time. I remember seeing it opening weekend and the theatre wasn’t even two thirds full. In the US, it did $28 million in its opening weekend, which isn’t huge but isn’t bad, but for a $200 million dollar movie, it was bad news. But word of mouth spread after that first weekend and the box office started to do something it rarely does after an opening weekend. It went up. Low and behold, when its theatre run had ended, Titanic was the biggest box office hit of all time and held that title for twelve years until it was overtook by another film that was not predicted to be such a massive hit. James Cameron’s Avatar. Rose DeWitt Bukater (Kate Winslet) was a passenger on the most luxurious ship of its time in 1912. Along with her mother Ruth (Frances Fisher) and her fiancé, Caledon Hockley (Billy Zane), Rose set sail on April 10th, 1912, on the maiden voyage of the Titanic. Jack Dawson (Leonardo DiCaprio) was also a passenger, but not in upper class like Rose. Jack was an artist and drifter and won third class tickets with his friend Fabrizio (Danny Nucci) in a game. When Jack and Rose meet, it is destiny and they are instantly drawn to each other. But what starts as a whirlwind affair ends with one of the most famous disasters in history as the Titanic collides with an iceberg in the Atlantic and starts a slow sinking of the massive ship. 84 years later, Rose recounts her story, the love of her life, and the sinking of the Titanic. 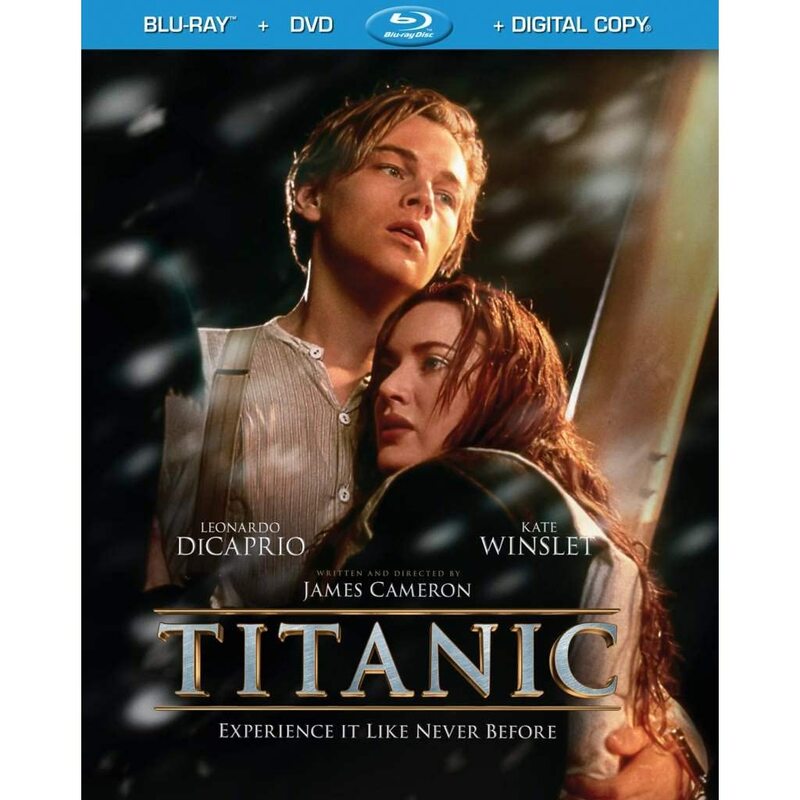 James Cameron is smart that he wrapped the story of the sinking of the Titanic with a fictional love story that was simple but extremely effective. Jack and Rose put a face to the passengers of the Titanic and represented the people that survived as well as the ones who didn’t. The result is a beautiful tale of romance and a staggering story of survival. One thing Cameron is known for is his attention to detail, and now that Titanic has arrived on Blu-ray, it is on full display. I almost found myself not even paying attention to the action on screen throughout the film as I was too busy taking a detailed tour of the ship and its intricacies. Every single inch of Cameron’s set design is on full display here and it is fascinating to look at. There was simply nothing missed in replicating the ship in every way. Production design aside, I forgot how much I enjoyed this movie and its love story. The characters of Jack and Rose are totally relatable to everyone in one way or another. So for the first half of the film when no disaster has struck yet, you do not find yourself bored or waiting for it. It is simple but effective storytelling at its best. As the narrative flows around the main characters, we also meet many of the other people aboard the ship, from the Captain to the men working in the engine rooms. It really is an engaging bunch of characters. But when the action does start, it is even more breathtaking on Blu-ray that it ever was. The way Cameron shoots the disaster through every step of the sinking is heart pounding and exciting. It is also sad, frightening and touching. If ever there was a realistic and terrifying depiction on film of a disaster, Titanic is it. The Blu-ray from Paramount is easily one of the best Blu-ray releases of the year, maybe even ever. The picture is stunningly flawless. There are many colors aboard the Titanic, from décor in the ship to the period clothing to the ocean itself. All of them are rendered perfectly in gorgeous detail. The colors are bold and deep, black levels are inky and solid, and detail is simply astounding. You can practically count the dishes on the shelves. Cameron himself supervised the transfer and his attention to detail really shows. The picture is matched perfectly with the amazing soundtrack. The first half of the movie is subtle surround and natural sound, but when the accident happens, all hell breaks loose in your home theatre. Surround is crazy active with water rushing all around you and the creaks and groans of the dying ship always present and haunting. The set is loaded with tons of great special features that are actually entertaining and informative and not at all filler as well. This is in the top 3 must own Blu-rays of the year for sure. Very highly recommended.